Hi everyone! 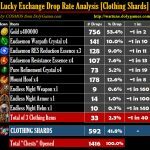 In this article I share with you all the data, analysis / results I prepared for the Wartune Easter events / exchanges. 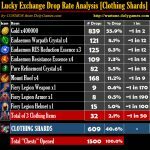 I will start with the largest data-set of Easter Ribbon Lucky Exchange item drops based on large 3290 data and after that the Easter Egg Lucky Exchange based on 469 data. Note: the Easter Ribbon Lucky Exchange drops a “Rare Item” after 30 exchanges while the Easter Egg Lucky Exchange after only 15 (but eggs are harder to get). 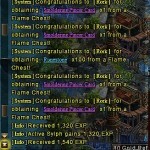 Table is based on 3290 exchanges, including Rare Item drops. Interestingly the chances of Wings are the same as the chances for the mount. This is unusual. I am not surprised at the chance for the mount but the Wings should ideally (to be fair) be somewhere in between mount chances and regular clothing chances. I think this exchange is fantastic – all the items are very useful to players. There is not 1 crappy item. Easter Candy was the most unpredictable. In some cases it dropped more while less clothing items and in other cases it dropped less while more clothing items. The large data set should iron out such differences but for players who only do 500-1000 exchanges they might get more or less candy than expected. Table is based on 469 exchanges, including Rare Item drops. Bear in mind since the sample size is not huge the accuracy is lower for the very rare items. Most drops are just green pennants, which is very annoying (I was opening 1 by 1 to record data). 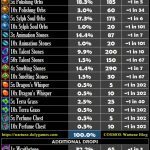 Pennant Ascension Stones are dropping still in very small quantities both in this and other exchanges, so the Wartune team is still very conservative with this item controlling that the players don’t get too many of them. So at this stage the quantities are not very usable. March Hare +500 stats mount seemed to have dropped more frequently than all others. Perhaps because of Easter the Wartune team wanted to gift this rabbit / bunny mount to players. If so, I thank the team on behalf of all players. Naturally this does not mean that everyone will get this mount, but in the data it was more frequent than others. The best way is to see what you get from the Easter Egg exchange and control your Easter Candy quantities very well to exchange directly via Hot Events for the items you did not manage to get. I have seen many reports of players getting most items (clothing, wings and mounts) and missing only 1-2 or even managing to get at least 1 of all items. 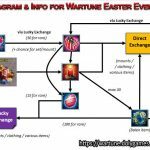 I think the 2018 Wartune Easter events & exchanges were fantastic for all players. While having 5 event items is really a lot and struggling with inventory space due to too many items – ultimately we players got 1-2 full clothing sets and 2-4 mounts in addition to all the other resources. Was my analysis/report useful to you? Are you happy with this 2018 Wartune Easter? Do you have more information to add about these Wartune events/exchanges? If so please share in the comments below. Thanks for analysis. With me, this is the best event ever. I got 100k adv hena, all the mount and 3 clothing set. I’m Shen from Wartune S576. Nice to meet u guys.